"Before treating with Dr. Murray I was in excrutiating pain. I had this pain in my left leg starting way back when I was 5 years old. It has been especially painful more recently, so much so that it became difficult to sleep at night. A friend referred me to Murray Chiropractic. I've been treating with Dr. Murray a few weeks and now am happy to say I'm getting a good full nights sleep and am able to do more walking and exercise now." "Before coming to treat with Dr. Murray, My right shoulder was very painful and I couldn't lift my arm or even comb my own hair. 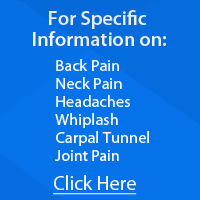 I do a great deal of computer work 6 days a week and that became very painful also. I tried some things at home like cold & hot packs & aspercream. However these gave me only temporary relief. Since my treatments at Murray Chiropractic, I find it easier to move my arm and shoulder and comb my hair and even type on my computer. I rate my improvement at 95%"
"I had been in horrible pain for 3 weeks. I had so much trouble getting my sleep because of the pain. It even affected my mood and I found myself being crabby. My father referred me to Dr. Murray for care. The changes I've seen over the past few weeks are great. The exercises Dr. Murray trained me to do and the spinal adjustments have really helped. The staff are very helpful and always nice and comforting when you come here." "When I came to Dr. Murray it was because I couldn't turn my neck and the pain radiated into the left shoulder. The restriction in my neck mobility made it impossible to turn and back up in my vehicle at times. I drive for my job, so that was really affecting my life. My treatments have really helped. In fact I would say my improvement has been excellent." I came to Dr. Murray's Clinic for treatment due to the severe headaches. The pain interfered with my daily life. When I had to do my daily work at my job, I had difficulty due to the pain. My problem started after I was in a car accident when I was 18 years old and have lived with the headaches for all these years. I do not know what it was like not to have headaches. I have tried other Dr's such as various medical doctors and got some temporary relief. I finally had a severe headache and came to Dr. Murray for a treatment and he took x-rays and had come up with a treatment program for 90 days and I am about a good month into it and have had a few days when I haven't had a headache. This is such and improvement because my headaches were previously a 24 hour problem, every day. When I don't have one it is really great! Because of the many years, (42 to be exact) of living with headaches not to have one, for just one day, is really a big thing for me. I am excited about the program I'm on and will promote it to anyone who has headaches or pain like I have experienced. I will comment later on when I'm done with the Program and can experience the full benefit of Chiropractic care. Dr. Murray, you have made a difference in my life. I am looking to continue the full Program to gain much more relief. I would very definitely recommend Chiropractic care to others. I have had some back problems in prior years and Chiropractic care has helped tremendously. I recommend Dr. Murray to a lot of people who do not have a Dr.
"I fell off a step which resulted in ongoing knee pain. My niece told me about her good results with Dr. Murray when she experienced a similar injury. I didn't know knee problems could be helped with Chiropractic. I'm very happy with the results of my treatment & can go up and down steps again without pain!" "I was very skeptical about coming to a Chiropractor. I'm glad I finally came to Dr. Murray. I just wish I'd come sooner. For over 2 years I had pain everyday when I walked or stood, and many of my daily activities had become difficult or impossible. I had back pain which involved hip and leg pain. When I would try standing at church , I had to stand on one leg, the pain was so bad. I had been using a 4 wheeler around the farm more and more because it hurt to walk even from the house to the barn or garden. Since coming to Murray Chiropractic For treatment I enjoy walking again and am up to 1/2 mile without pain. I have received 95% improvement or more. Even the tingling in my leg which is partially due to my diabetes is at least 65% improved. My overall improvement since receiving treatment from Dr. Murray is excellent! Now I feel I can live again!. This has even affected my mental outlook for the better!" "I brought my newborn baby to Dr. Murray because her rt. arm and legs were blue since birth. She wasn't sleeping good and was cranky. I had taken her to my medical doctor and I was told she would grow out of it. Shortly after having Dr. Murray treat her she had normal color return and has started sleeping now. My recommendation to other parents: If your baby has colic or has other problems, find a Chiropractor such as Dr. Murray, who you trust and have your baby checked out." "I've had significant back pain and severe headaches for years. I took pain med's just to help get through the most essential activities of daily life. When you live with this intensity of continual pain for so long, it affects your own ability to really enjoy life. I decided to see Dr. Murray for help. My improvement is excellent as my headaches have dramatically decreased in frequency & severity. My back pain is 60% improved thus far. My sleep and overall feeling of well being has improved. Even my problem with Restless Leg Syndrome is 98% gone! I'm a very active person once again and even meeting my goal of losing weight. I recommend Murray Chiropractic!" "I had low back pain for years. Then when it became severe and I couldn't sleep or work, I knew I had to do something now! I didn't want surgery and when Dr. Murray recommended the Lordex treament, I was glad to try it. Now I feel better than I have for years." "After low back surgeries left me with very limited results, I wanted real relief from lower back pain. Life just wasn't fun anymore. After Lordex treatment program, I am doing things which I haven't been able to for over 10 years. Before ever having surgery, I recommend you try Lordex first." "My low back pain was becoming very sever and I was losing sleep from it. Lordex has given me a significant drop in my pain level and a stronger back. I rate my care, service, and results as excellent at Murray Chiropractic Clinic." "My low back pain increased over the years to the point I couldn't do anything, including work. I have had excellent results with Lordex and my whole experienc at Murray Chiropractic Clinic was professional, compassionate, and outstanding." "I have degeneration in my low back which caused back pain and leg numbness. I chose Chiropractic care over drugs. I find the Lordex relaxing and most of all, I beat low back pain without drugs or surgery. I love the staff, doctor, quality of care, and healing results I got at Murray Chiropractic Clinic." "I had low back pain for nearly a year. The pain put limitations on my daily activities such as my work coaching, and I had to quit exercising. After seeing an MD, Physical Therapist and Chiropractor, I finally listened to family members and made my appt. with Dr. Murray. Since undergoing decompression and strengthening therapy, I can go about my day without even worrying about low back pain. I definitely recommend Chiropractic and Lordex treatment with Dr. Murray." "A few years ago I began having frequent spells with my vision getting blurry. For example, I would be reading and could only see portions of the words. I went to Dr. Murray and described my problem. He performed a technique call BCT and it helped right away. I only have this problem rarely now and Dr. Murray has helped me so much." "I came in because my neck and my right elbow hurt. It was about two weeks before I came in that the pain really began to be constant. My condition hurt pretty bad. When I was planting corn I had to put a string in the cab of the tractor so I could hold my shoulder up. That was the only way I could get relief and do my work. My treatments have always helped. Dr. Murray is the one I always go to. I am 100% better than what I was. Before treating at Murray Chiropractic, I couldn't be in a car without my right arm going numb. Now I can drive long distances and it doesn't go numb at all." "I came to see dr. Murray because I was having low back pain going for 3 days. It hurt to walk or stand. I also was in a great deal of pain when riding in my vehicle and the pain was getting worse. It was so severe I couldn't even work. My pain rating was a 9 on a scale of 1 to 10! I've had low back pain before, but my back pain had gotten worse now. Since coming to Murray Chiropractic, I found out what was causing my problem when Dr. Murray showed me on my x-rays and explained what was going on with my spine. As of today I would rate my progress as excellent, 90% improved! My coworkers have even noticed I walk without being bent sideways. I refer other to Dr. Murray for treatment. My general health picture has improved as I'm able to work now and feel better!" "Our son was suffering from some neck pain. He was born two months earlier after a difficult labor. We believe he pinched a nerve or something out of place. He seemed to be constantly in pain, his cries and stiff neck didn't quit. He would cry himself to sleep every 2-3 hours. We were at our wits end. Our son was in constant pain until our first visit here, afterwards he slept for 4 hours. One week later after his next treatment he slept for 6 hours. After the 3rd and last treatment he slept through the night and has ever since. Thanks Doc!" "At age 20, I had already suffered for over 10 years with headaches. I often took up to 8 aspirin daily to deal with the migraines. As a college student working 2 jobs, I can't stay home in bed. I heard about Dr. Murray's success with headaches and decided I was tired of the pain and drugs! Dr.Murray gave me a thorough exam and took x-rays to find the source of my pain. I followed the course of treatment and I'm happy to say I have not had a headache in over 1 1/2 years, My busy schedule is much less stressful thanks to Dr. Murray's care." I just didn't know what I was going to do. I had even tried care with other doctors unsuccessfully. Severe hand pain affected every part of my professional and personal life. I heard about Dr. Murray and am so thankful I made the long drive from MN. I am extremely pleased with my care at Murray Chiropractic and tell all my friends to come here! I have regular spinal checkups just like dental checkup to help maintain my wellness.